I attended the Angels game at Dodger Stadium tonight with my son. We watched the Angels no-hit the Dodgers but lose the game. Jered Weaver and Jose Arredondo combined to no-hit the Dodgers. I took some photos of them before the game. There is also a photo of my son and I in front of the scoreboard with the zero hits. It was a bittersweet ending to see the Angels no-hit the Dodgers but actually lose. Ironically, MLB supposedly changed the definition of a no-hitter a few years back and this game supposedly doesn’t officially qualify as a no-hitter. It doesn’t really make sense since a pitcher can pitch a complete game shutout in a 5 inning game when rained out. Either way my son and I witnessed our first ever no-hitter whether MLB wants to call it one or not. I was happy that I got to share the moment with my son. MLB cannot take away the memory of us sharing in it together. Comic legend George Carlin passed away today from heart failure. In 1991, I celebrated my 21st birthday in Laughlin, Nevada. I went to see George Carlin perform at the Riverside Casino and had a great time. 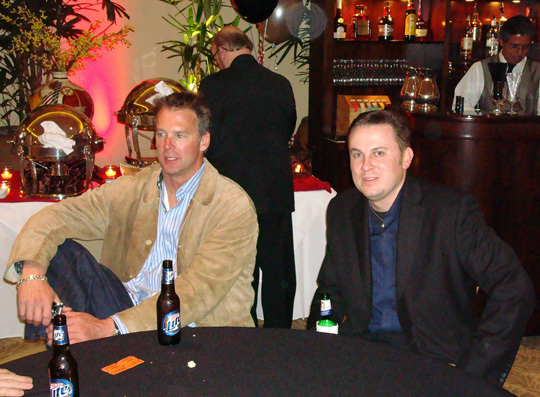 I went with my friend Jeff Ford and we ordered a bucket of beers at the performance. It was quite a thrill to order the bucket of beers and see a show since I had just turned 21 five days before the show. The performance was hilarious and I still think of many of the jokes that were said that night. George Carlin was a great entertainer and I ended up catching additional performances of his over the years. I even went to watch a taping of his television show. He peformed recently near my house but it was my wife’s birthday and she didn’t want to attend. I wish I had a chance to catch that performance. He is a legendary entertainer and will truly be missed. Below is the ticket from my first Carlin show, five days after I turned 21 years old. Missed Them by 2 Weeks! The Angels will play their first ever games in Philadelphia this weekend. I returned from my first trip to Philly two weeks ago. They have a great ballpark and I was fortunate enough to catch three games there. Hopefully the Angels can win three games there 😉 Below is a picture of my from seat (2nd row behind the vistor’s dugout). Unfortunately Ken Griffey Jr. didn’t play in the game. He was only one home run shy of hitting 600 home runs. Only Barry Bonds, Hank Aaron, Babe Ruth, Willie Mays, Mark McGwire, and Sammy Sosa have hit 600 home runs. Posted on June 19, 2008 Categories Angels9 Comments on Missed Them by 2 Weeks! I want to thank my Father for being such a great Dad. I am truly blessed to have such a great family. My son and daughter made the day special. I am so proud of both of them. I was also able to attend my third consecutive Father’s Day Game. In 2006 we went to Oakland and saw the Dodgers and A’s play (we were in town for Angels game the following night). In 2007 we attended the Angels game at Dodger Stadium. 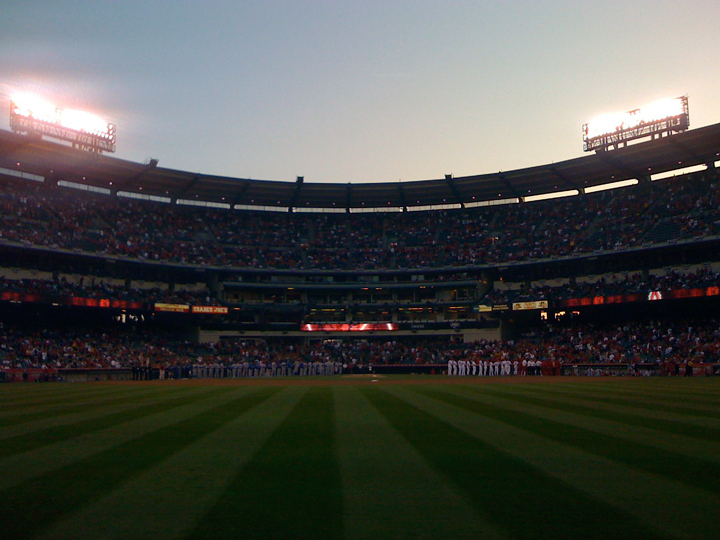 This year we went to Angel Stadium for the ESPN game of the week featuring the Atlanta Braves vs the Angels of Anaheim. HAPPY FATHER’S DAY to my Dad and any Fathers reading this! Baseball season is back and I’ve been to all of the games at the stadium this week. Tonight the Angels opened up a series against the Indians. The starting pitching was phenomenal. Joe Saunders pitched eight solid innings for the Angels and the Indians countered with Fausto Carmona. I took my eight-year-old son and he kept score the entire game. In the middle of the game, Casey Kotchman fouled off a pitch into the Diamond Club and I tried to reach over the divider and grab it with my one free hand. I had a pizza in my right hand and just got a finger on the foul ball with my left hand. I was disappointed that I didn’t get the ball. The game was tied at one in the eighth inning when Torii Hunter came up to bat and hit a solo home run. Francisco Rodriguez came in to close out the ninth inning and fell apart. He was pulled and Scot Shields continued to let the game slip away. I was thinking how my luck has dwindled away. I missed out on a foul ball and the Angels were now losing 4-2 and were likely to lose a game that they should have won. They haven’t lost after leading in the eighth inning for years. The first batter for the Angels in the bottom of the ninth hit a fly ball for the first out. My luck changed with the next batter. Gary Matthews Jr. fouled a ball back and it went to the section to my left. I jumped out of my seat and stood at the end of the aisle. It took a huge bounce and I jumped up to grab the ball and secured it with both hands. Nobody else even touched it and it seemed as though it came right to me. I was ecstatic that I caught the ball. This was only the second foul ball I’ve ever got after attending hundreds of games. This was the first one fouled off by an Angels player. The other one was pitched by an Angels player. After I caught the Matthews foul ball, Matthews walked and Vladdy and Garret got on base to load up the bases for Torii Hunter. Torii hit his second home run of the game, a walk-off grand slam! Many in the crowd had departed early but those of us that were still there went crazy! It just goes to show that anything can happen and sometimes when you are feeling down on your luck, something great may be waiting just around the corner. As they say, never give up and it isn’t over until it’s over! 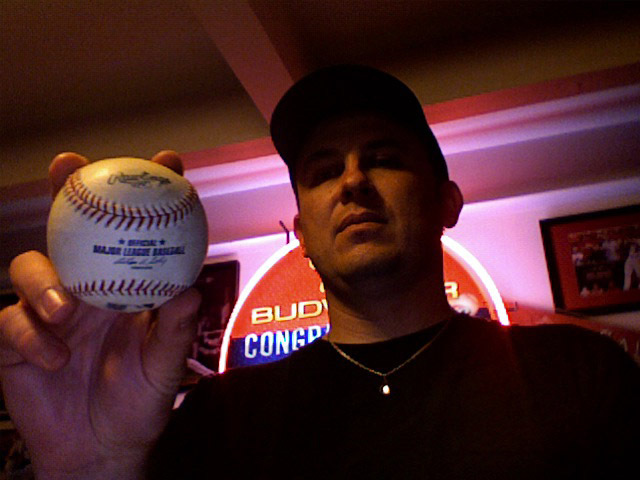 Below is the foul ball that I caught. Posted on April 7, 2008 Categories Angels1 Comment on WALK OFF GRAND SLAM! You can watch the actual video I submitted on the Anaheim Ducks NHL website. You can check it out here. The Anaheim Ducks and Honda have a contest where you state what you would do to win a Honda Ridgeline. I made a video for the contest and it was aired at the Honda Center tonight. It was a really cool feeling to hear the audience reaction to the video. You can watch the videos from tonight by clicking here. Christian was the Honorary Duck tonight. Check out the video here. I will post photos soon. I must say the Anaheim Ducks and their players are truly a first class organization. Today I attended the First Flight Field Trip with my son. I had suggested to one of the teachers at his school (Michelle Kauten) that the children attend this event. The Ducks put on quite a production for the kids. It was entertaining, educational, and most importantly captivating. There were over 16,000 in attendance and to keep them entertained over a 3 hour period is no easy feat. The event was free and they gave away posters to all in attendance. The Ducks even gave away a team signed and framed jersey to a lucky child. Our bus was late so as we waited outside we saw a couple of Ducks players leaving. 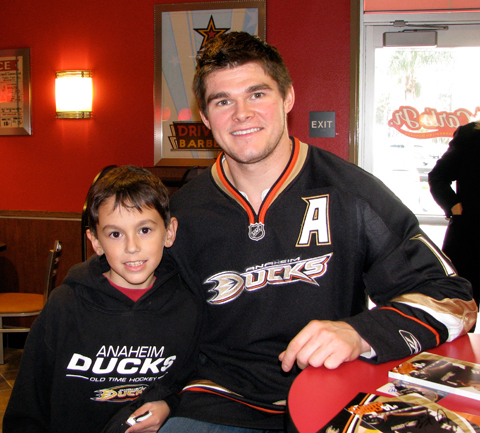 I was quite impressed that Kent Huskins and Chris Kunitz signed autographs for everyone that wanted one. The kids were very thrilled to get their posters signed. 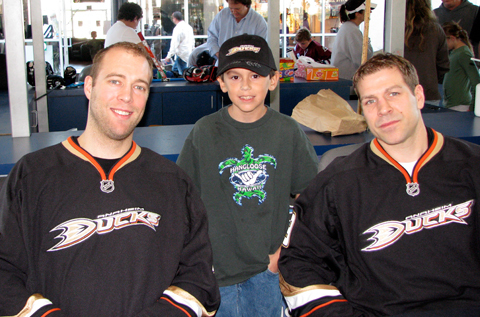 The Ducks put on so many great events throughout the community and for season ticket holders and kids club members. I can’t imagine any other hockey club doing a better job than they are. Tomorrow night my son will be the honorary Duck and gets to sit in the penalty box for pre-game warmups. I am looking forward to that. Below are some pics from some recent appearances the Ducks have made. 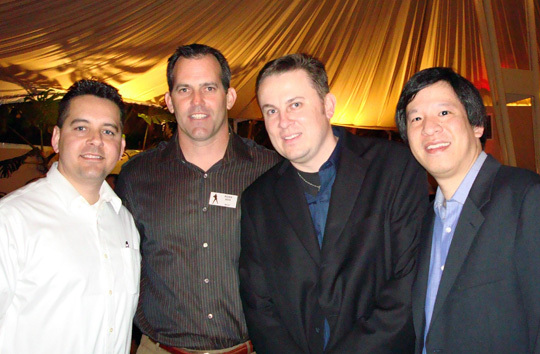 Last night was the annual fundraiser for OCCAPC at Palm Gardens in Newport. There seemed to be many more people there this time. There were plenty of athletes as well including JS Giguere, Sammy Pahlson, Chris Pronger, Darin Erstad, John Lackey, Adam Kennedy, Chuck Finley, Mickey Hatcher, Bobby Grich, Clyde Wright, Robb Nen, and more. There was great food and an open bar (including Peroni). We started off the evening checking out the silent auctions. Giguere was near the items he had donated, so I talked with him a bit regarding the championship and the items he donated. After grabbing a couple of drinks and some food we sat at a table to eat with Sammy Pahlson, JS Giguere, and their wives. We talked with them for a bit until they were called away to go pose with the Stanley Cup for a magazine. Had a good conversation with John Lackey including a discussion of his favorite water hole, the Goathill Tavern. He also introduced his fiance to us. Talked to Clyde Wright a bit and he mentioned the appearance by Nolan in Newport. He also said he will be going on a golf outing with Nolan in Austin, Texas in April. 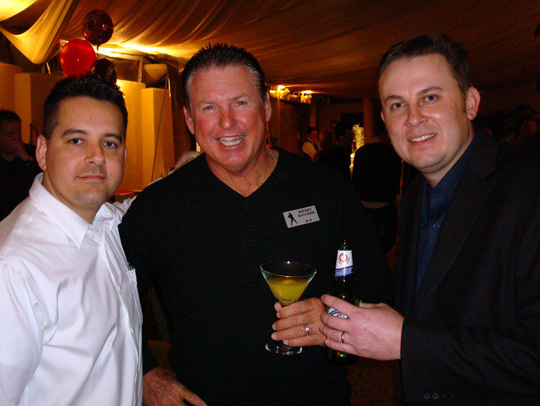 Mickey Hatcher remembered us from last year and we had a great conversation regarding the Angels. We spoke with Mickey throughout the night. Really cool guy. We played poker and Phil ended up at the final table. I bid on quite a few items in the silent auction including a 2004 Vladimir Guerrero team issued jersey, Teemu Selanne stick, JS Giguere stick, a jersey signed by all the athletes, and an Honorary Duck for a Game certificate. I was outbid on everything at the end. The one item I was trying to focus on was the Honorary Duck for the game certificate. At the very last second I was outbid by someone and she said it was because of my last name? I questioned why and she asked if I knew who she was. I said no and she said she was Jim Everett’s wife. I told her my name was pronounced like CD-ROM not Rome. Her husband was on the Jim Rome show once and Rome kept calling him Kris. I knew the story, so after clearing my name, she offered to let me take it as the high bidder. The certificate is good for four plaza seats (they are the GM, Brian Burke’s seats) and we get to watch the pregame warmups from inside the penalty box. Afterwards my son will get to meet a Ducks player and receive an autographed stick from them. He will be shown as the Honorary Duck on the jumbotron during the game. I sat and spoke with Chuck Finley for a little bit. I had him sign a retro Angels cap for me. Below is a pic Aaron took of us. Later in the evening I spoke to Darin Erstad regarding game used helmets and the latest on his career. He signed his helmet and inscribed game used on it. 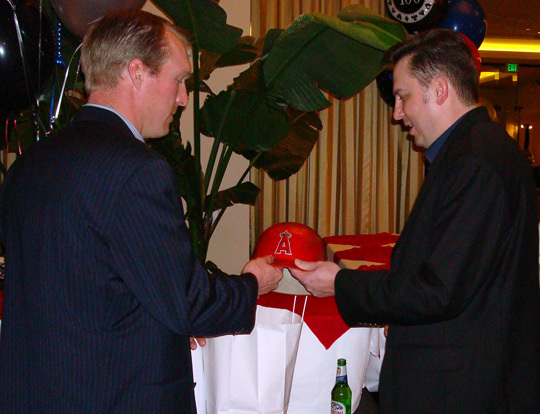 I also had him sign a couple of banners of him that hung at Angel Stadium. Here is a photo of him and I discussing the helmet.